Susana Gardner lives in Switzerland where she runs Dusie Press, which publishes full-length poetry collections and an online journal. She is also the author of three books: [lapsed insel weary], Herso, and her most recent collection Caddish. Gardner took some time via email to answer a few questions for me about her newest book. You mentioned during one of our previous conversations that your poem “Idylls and Rushes,” in your new book Caddish, appropriates text from Colette’s The Vagabond. Could you tell me a bit about what attracted you to this text and your engagement with it during the writing process? What, generally speaking, do you think techniques like appropriation, collage, and erasure offer poets writing today? I wrote Idylls& Rushes for the 18’s Anthology for Knives, Forks, and Spoons Press (UK) in the winter of 2010/2011. The editor, Mark Cobley solicited poets to contribute to the anthology by writing 18 poems with 18 words each. This was interesting and new for me—The restriction given which was naturally that, restrictive! New possibilities came from this new guideline and process, which I would have not had otherwise. For example, I had to be more creative if I wanted to have more words…thus sort of Celan-ing words…jamming words together thus creating new words with new meanings. I had been rereading Collette’s The Vagabond. I loved the language and construction as well as the storyline. I’m not sure if that was in part to the period in which it was composed, or the fact it was later translated from the French. The story itself really resonated with me as a single woman, alone in Europe, making choices outside of the social normative grid, so to speak. My situation is a bit different because I am also a single mother, and while being a single mother, or divorced single mother is more and more common there are still elements of social deviance intimated in the general social fabric…these are felt. At some point I started writing down words that I found somewhat outdated or words I found compelling or that I was just attracted to. I continued to do this throughout the reading and once I was finished decided I wanted to use the book itself as a material part of the of chapbook as well, which I would make from the 18’s project. I used the pages as filler pages as well as in constructing the covers. So, other poems were thus created in this process as well, like the first poem of the book, Artless Adores Her. Appropriation, as well as other techniques, like erasure (lifting), collage, etc, simply offer poets a greater range of possibility. I don’t think there is any one way a poet must start a poem or poetic project. Having other means simply makes it more exciting and complex and interesting. Erasure or appropriation also includes others. We all are writing together somehow, the body poetic merges. 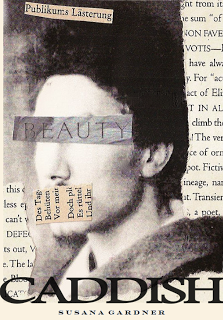 The cover image of Caddish is a visual collage you created, titled “Beauty.” Could you explain your relationship to visual collage and other arts? In both practice and theory, how do you understand or conceive of the relationship between poetry and the visual arts? Are there certain thoughts or feelings more appropriate or better suited for one medium or the other? Are there any specific collagists that have informed your practice? Collage is something I do simply for fun or when I can’t write. I do think there is a visual embodiment that can accompany words. Collages that also have text enter another level for me in a meta-poetic way or endeavor. I have done collage work for many years, but this was the first time that I used my work for a book cover of mine (I have done so for the online journal Dusie). But for my own work it initially felt riskier and scarier. The collage itself was made years ago. I am not sure I wanted to silence Ezra, but perhaps his reign of imagism, etc. It wasn’t an intentional act, the blinding or silencing of poor Ezra (he did it to himself though didn’t he? ), it happened and I didn’t want to undo it after that point. The German text is also an interesting random composition. I love the randomness that can happen and the subsequent surprise. I like many artists, but I think Joseph Cornell and his miniatures and shadow boxes certainly influenced me in the beginning. Also, any art that includes written text, there are many pieces in the permanent collection here in Zürich of Cy Twombly, Jasper Johns as well as many Dada works which I adore. The Dadaist collages of Hanna Hoch and much of DuChamp’s work, especially The Bride Stripped Bare By Her Bachelors Even, which isn’t collage but still an influence. Some of the poems in Caddish, as well a few in Herso, employ a variety of typefaces, font sizes, and unique page layouts that create poems that are visual fields. It could be argued that these poems, when engaged by a reader, are more visual than textual objects. Could you speak about these poems and how you intended them to be received? What was the process of constructing these texts? Do you think about them differently than some of your more traditional poems? Are they influence at all by the Futurist and Dada movements, both of which experimented with text in somewhat similar manners? It is possible that I was influenced somehow by the Dadaist poets, since I was composing much of Herso while I was working at the Cabaret Voltaire as a curatorial assistant. Herso was very much an exploration of language. While writing Herso, I felt the need to destroy any previous concept or relationship I had with language, I needed to destroy it in order to bear it again, to give new birth. I also do all of my own layout, in InDesign. This gives me the possibility to really engage the page in different ways which is something I really appreciate the ability to employ as a poet. Some of the more palimpsestic poems are not readable in a traditional way, though I have recorded these ones layer by layer. Ultimately, this challenges me to think in different ways, develop different strategies and find the page anew again and again. I think the visual aspect also speaks to my desire to create a pictorial field as well as text field. There are really just so many possibilities there is no reason to settle with just one. I don’t feel there is any one way to receive such poems either, the experience can vary from reader to reader and that is all the more exciting to me. To conclude, what direction do you see your work following in the immediate and near future? Are there any poets or poetry that you feel has been influencing your current writing, thoughts, or feelings? What are the overriding concerns that have been consuming your art and poetry lately? Right now I am interested in writing an epic poem, though I oscillate between that and a lyric book. I have had the idea to do both for some time actually. I hope it will soon germinate fully into whatever end form it will embody. My life is full of huge transitions right now, so I am just trying to ride with the waves of it. I will revisit some important long works, like Notley’s Descent of Alette and Alma. But other than that, I don’t have any concrete plans. I have started collaborating with another poet, that has been fun! There is an immediacy that exists in such a project and concurrence that is totally different and other than a solo project, and I am digging that. I am also just trying to finish a bunch of projects in the next few weeks that I have been meaning to finish for some time in way of my own press, I think the completion of these will assist in the creation of my own new book as well.